You've seen a few shows on TV, and working with wood looks like it could be quite entertaining and rewarding. After all, you get to create something that you can proudly display to your friends and family. But where and how do you begin to move from expressed interest to hands-on experience? 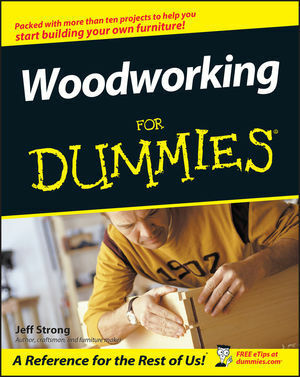 This handy reference packs in essential information for the novice woodworker and some advanced tips and tricks to jumpstart any woodworker's existing skills. Includes detailed illustrations and how-to photos. Jeff Strong, of Lamy, New Mexico is not only an accomplished craftsman and woodworker, but is also author of Drums For Dummies and Home Recording For Dummies. Jeff began creating sawdust at a very early age while assisting his father, a master craftsman, build fine furniture. He has designed and build countless pieces of furniture and has recently completed the designs for a commercial line of furniture blending Arts and Crafts and Asian infuences which has already secured representation with a gallery in Santa Fe, New Mexico.